When you look through Regenerative Design Group’s portfolio, much of the design process is only suggested by the finished project. The “invisible” parts of design work — site visits, data collection, analysis, research, community engagement, conceptual development, etc. — are implicit in that the final design successfully fits the landscape and fulfills the client’s purpose. A crucial, but often unseen, component of designing productive landscapes is the assessment of a site’s soil. 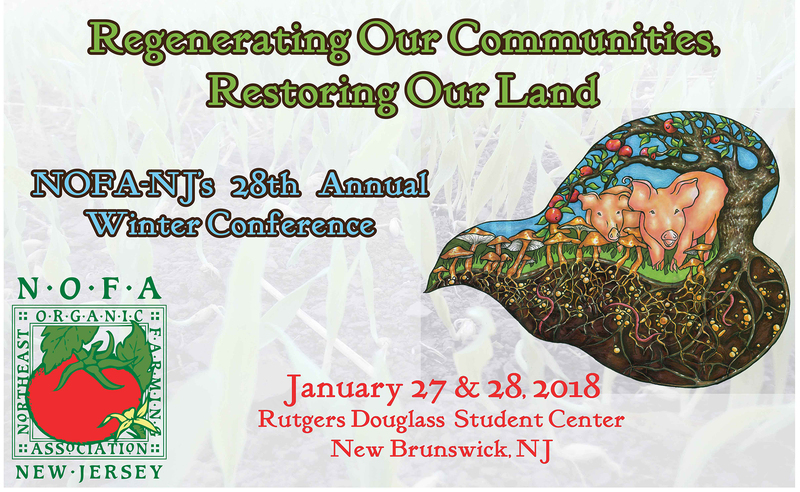 Last week, I spent two days at the Bio-Food Nutrient Association’s Soil & Nutrition Conference exploring land management practices that sequester carbon, enliven landscapes, improve nutrition, and maximize the biological properties of soil. Every one of RDG’s projects involves soil. Soil analysis—from lab tests and on-site observations—are among the first rounds of data we collect. Soil composition lets us know which plants will thrive on a particular site — and which amendments are needed to create optimal conditions for the goals of the project. Of course, most of our projects go beyond simple soil amending: we focus on regenerative practices that build organic matter, keep soil in place, and encourage mycorrhizal relationships. Yet there is still so much to learn about increasing biological life in soils. There is a growing movement of soil scientists, farmers, home gardeners, and nutritionists shifting the focus of soil fertility from a material one to a relational one. Although soil has physical, chemical, and biological properties, most practical applications of agricultural science focus on the first two. University extension soil tests include an “organic matter” percentage, but information about what that organic matter contains is left to the imagination, while the physical and chemical properties are assessed in detail. Recommendations to balance the available soil nutrients with purchased fertilizers fail to address the ways that disturbances like tilling and compaction affect a soil’s biology. 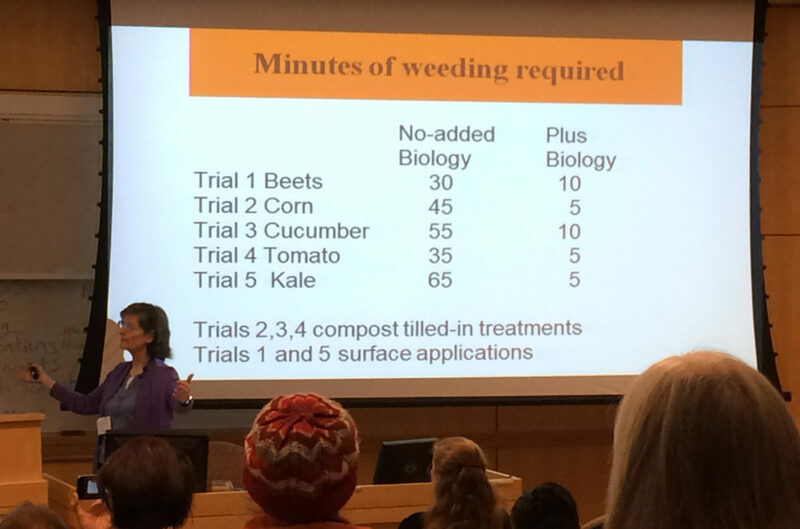 Elaine Ingham explains another benefit of using soil biology to increase yields: a higher ratio of fungi to bacteria inhibits weed germination, reducing weeding time at the Soil Foodweb’s research farm. Geologist and author David Montgomery shared a quote from Leonardo Da Vinci, circa 1510: “We know more about the movement of celestial bodies than about the soil underfoot,” and noted that while the statement is still true, we are moving toward a better understanding of soil. Part of the reason that the organic matter components in our soil tests are not explained is because they are complex and alive. The life cycles of the bacteria, fungi, nematode, and protozoa in soil are constantly modifying the amounts of nutrients available. Elaine Ingham, founder of Soil Foodweb Inc., described a soil test as just a snapshot of the nutrients available for plants at any given time, and do not help growers see the potential for what might become available to the plants in the future. She has helped growers improve the yields and health of their crops by focusing on balancing soil microbe ratios rather than adding soluble nutrients found in purchased chemical and organic fertilizers. Tim LaSalle, the first CEO of Rodale and recent founder of the Regenerative Agriculture Initiative, spoke further about what we can learn by focusing on the biological properties of soil. 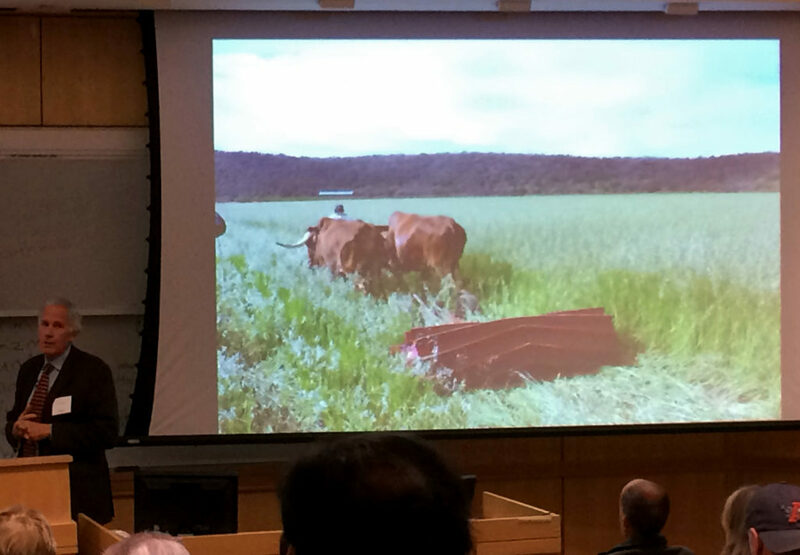 He shared the results of shifting land management practices for 5,000 acres of conventional soy and corn in steps: first, a no-till system was adopted, next the farmer incorporated diversified cover crops, and then intensive rotational grazing of ruminant animals. Finally, he began assessing the soil life, working to balance the ratio of living organisms in his farm’s soil. This combination of practices protected soil by fostering its biological relationships, and by focusing on the soil biology the farmer vastly increased both the rates of carbon sequestration and his crop yields. It was a positive reminder that agriculture can be a form of regenerative land stewardship that ultimately increases the health of local ecologies and the global ecosystem while also producing agricultural and economic yields. Tim LaSalle shows how no-till technologies can be adapted for areas of the world that use animal traction, in this case Africa. 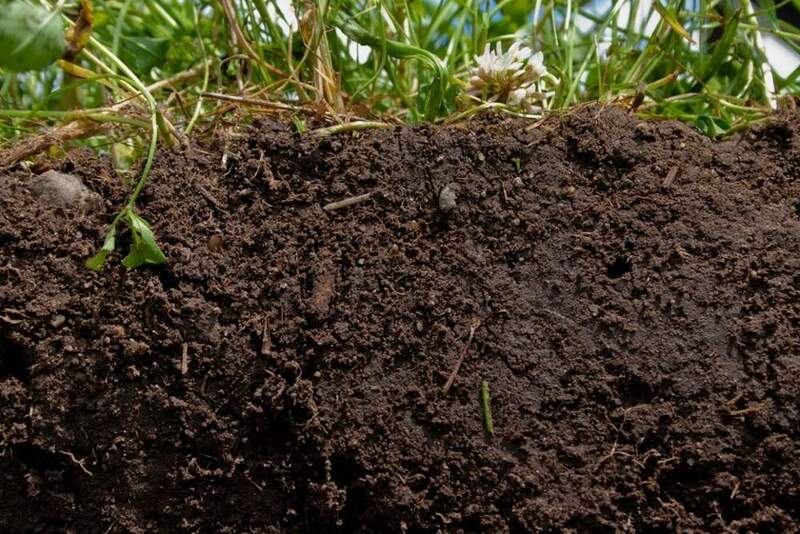 By focusing some of our attention on designing the soil in a landscape – fostering the desired soil biology – we can help our clients reduce their input costs, increase their yields, and become an active agent in carbon sequestration.